I adopted Ringo 3 ½ years ago. It didn't take a lot to decide. No reading over myriads of profiles of other beagles seeking forever homes. No weighing pros and cons. In short, when I saw his photo on the Midwest BREW website, there was no doubt. 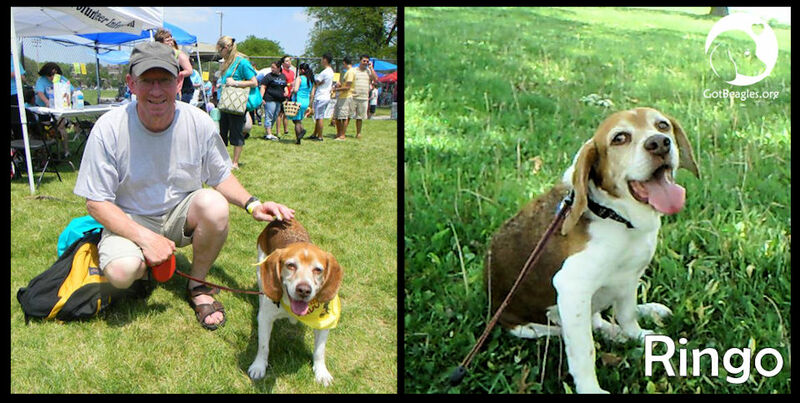 And not once since adopting him at Beaglefest 2012 did Ringo show that decision to be wrong. Last December 21st 2015, I had to send Ringo on ahead to wait for me at the Rainbow Bridge. Cancer had spread through his lungs and chest. An AARB senior when I adopted him, his too few years with me were full and loving. Though he slowed down with age, his spirit never diminished. Ringo was the gentlest dog I've ever met. Not once did I hear him growl or snarl. He trusted people, and was fearless in making friends. The ever-present joy in his eyes and smile on his face captured the hearts of all he met. Strangers would pat him on the head or back, and leave happier for it. That was Ringo's gift. He made people happy. He made people smile. And he taught me how little effort it takes to brighten the world. And that was his gift as well. Thank you, BREW, for introducing me to this amazing hound. And though my sorrow as I write these words is enormous, I know it's an insignificant price to pay for the joy and love Ringo brought into my life. Ringo was a treasure. I'll never regret adopting him.